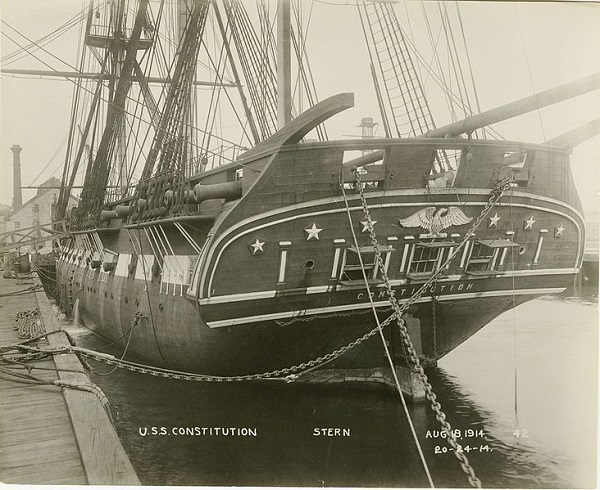 The USS Constitution was constructed between 1794 and 1797. The ship was one of six ships commissioned in 1794 by President George Washington to help combat French privateers during the Quasi-war with France and to defeat the Barbary pirates in the First Barbary War. The unique construction techniques and materials used to build the USS Constitution made it a formidable and powerful ship that later earned the nickname “Old Ironsides” due to its impressively strong and durable hull. These construction details are widely used by model builders to build USS Constitution model ships or to create USS Constitution model plans for other builders and are also used by the U.S. Navy to maintain and restore the historic ship. 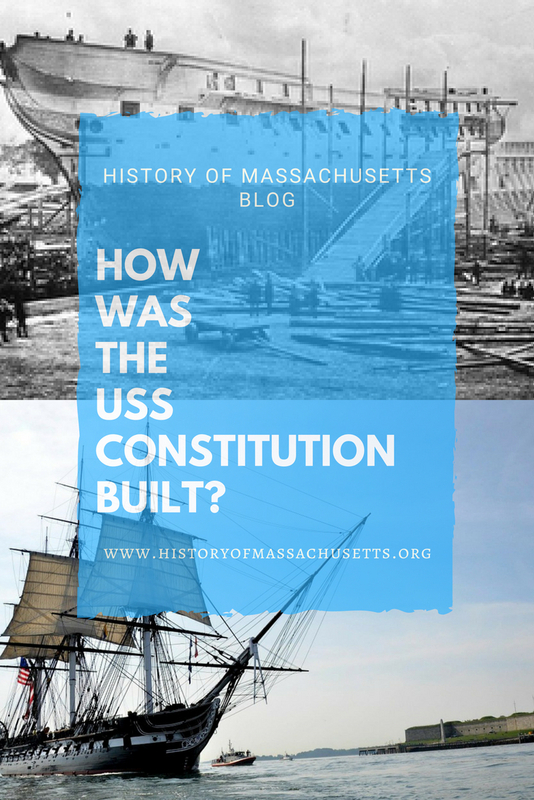 What Kind of Wood Was the USS Constitution Made of? The hull of the USS Constitution was originally made of white oak and live oak. The hull consisted of three layers with the outer and inner horizontal layers being made of white oak and the center vertical layer being made of live oak. When the ship was being built in the 18th century, live and white oak grew abundantly throughout the colonies and was easy to procur. The live oak used to build the Constitution came from the swamp coastal forests of Georgia. The ship’s masts, cabinetry, millwork, and trim were originally made of Eastern white pine. This tree was also abundant in the colonies. The ship’s beams and decks were made of longleaf pine. This type of tree grew mostly in the south and the longleaf pine used to build the USS Constitution came from South Carolina. The ship’s rigging components, such as sheaves, blocks, belaying pins, and deadeyes were made out of a type of wood called Lignum vitae. This is one of the hardiest, heaviest types of wood and grows mostly in the Caribbean islands and South America. Around 150,000 wooden pegs called treenails (pronounced “trunnels”), made of black locust, were used to pin the ship’s hull together. Tarred paper, called “Irish felt,” was placed between the hull and the 12,000 feet of copper sheeting lining it. The copper sheeting, as well as the ship’s brass fittings, were provided by Paul Revere and were forged in his foundry and copper mill in Boston’s North End. Today, the hull of the USS Constitution is still made of white oak but the deck, ceiling and deck beams are made of Douglas fir. Since white oak trees are hard to come by today, a specially designated forest of about 80 white oak trees was planted in the 1970s at the Naval Support Activity-Crane base to harvest and use in the continued restoration and maintenance of the ship. To allow the ship to carry a main armament of 24 pound cannons without causing the deck to sag at the bow or stern, a system of diagonal riders were installed. These were six thick curved timbers that ran from the keel to the gun deck on each side of the hull. This transferred the downward pressure of the cannon’s weight to the center of the ship, rather than to the ends. In addition, thick beams, shaped roughly like inverted letter Ls and called “standard knees” were installed along the length of the berth deck, which transferred the weight of the long guns on the gun deck to the original riders. These reinforcements allowed the placement of cannon along the entire length of the nearly continuous upper deck, called the spar deck. The spar deck’s planking was tied together with lock-scarfs, which are notched, interlocking deck planks, and were fastened to the timbers at the fore and aft. This stiffened the ship and prevented the deck from sagging. The ship was originally built without bulwarks surrounding the forecastle. A double line of hammock netting, supported by crane irons, extended from the main mast to the main hatch. There were also no anchor ports or bridle ports at the gun deck level. From the spar (upper) deck to the top of the mast, the ship is 172 feet (54.4 meters) tall. The beam (width) of the ship is 43.5 feet. The ship displaces over 1,900 tons of water and, in 1812, it could sail about 13 knots, which is about 15 miles per hour. 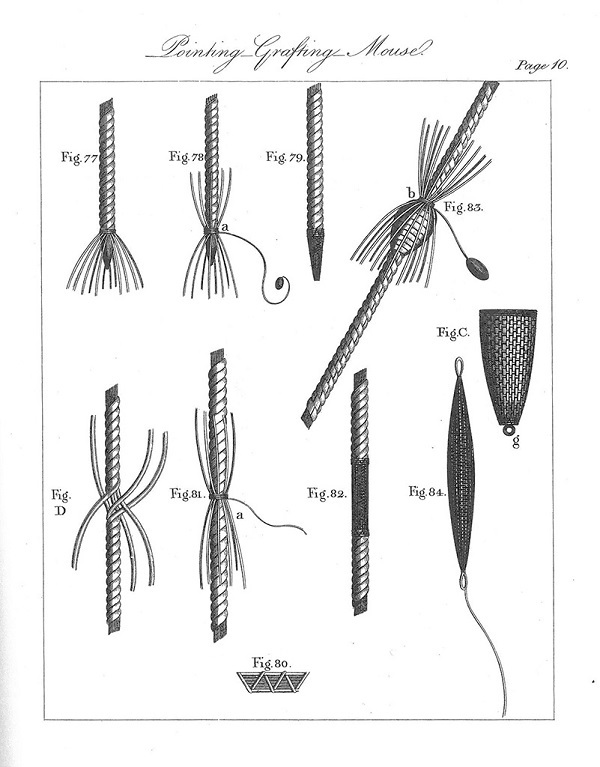 By the end of the 19th century, wire rope had replaced the canvas rope and was spliced back in on itself to create the loops needed to go around the masts. In the re-rig of of the 1927-1931 restoration, natural hemp fiber was used for standard rigging, which also did not need mouses. Much like the wire rope, the hemp rope was also spliced to make loops around the masts. In the 1992-1996 restoration, the standard rigging was changed to spun polyester rope and the mouses were reintroduced. These construction designs and techniques make this historic ship one of the strongest and most impressive ships of her time. What Did the USS Constitution Look Like in 1797? It is not known exactly what the ship looked like when it launched in 1797, according to the USS Constitution museum’s website. The designer’s original draught still exists but there is a lot of evidence that indicates the builders didn’t follow the plans exactly. The earliest known renderings of the USS Constitution are the painting by Michel Felice Corne in 1803 and the first ever model of the ship created by the ship’s crew and presented to Salem East India Marine Society by Captain Issac Hull on July 7, 1813. Corne’s painting indicates the USS Constitution’s hull originally bore a broad yellow ocher band along the gun ports from the hawse pipes to the quarter galleries. The band extended from the level of the channels down to the top of the main wales. Below the yellow ochre band, in the “bends,” the ship was tarred and above that, including the quarterdeck bulwarks, the ship was painted black. Corne’s painting also shows a yellow ochre “pin stripe” on the moldings at the spar deck sill level. The painting also indicates the stern had three windows, although a painting by George Ropes, Jr., in 1813 depict it as having five windows and the Hull model has six windows. Historians generally believe at the time of the War of 1812 the ship had six windows on the stern. The name of the ship appeared below the windows. It is hard to see the details of the stern decorations in Corne’s painting but in both the Ropes painting and the Hull model the stern is decorated with two stars on either side of the outer windows. On the Hull model, an image of a Nereid holding a wreath appears above each outer window. They are flanked by pairs of unmounted cannon. Near the traffail, in the center, is a spread eagle flanked by a row of stars. The stern is framed with a trim or molding that resembles carved rope. These decorations were probably painted in yellow ochre, as they appear in the paintings and on the Hull model, but they could have also been white. The bow was originally adorned with a figurehead of the Roman god Hercules, as can be seen in the Corne painting. The figurehead, which was carved by the Skillin brothers, John and Simeon, didn’t last long though as it was damaged during a collision with the USS President in 1804 and was replaced with a carving of a billethead, as can be seen on the Hull model and on the actual USS Constitution today. The ship’s guns were probably painted black. Their carriages may have also been black, although red, green and brown were common at the time as well. Since the Navy had no established painting regulations at the time it is hard to tell what it may have originally been painted. In the Corne painting, the inner and outer thirds of the bowspirit are black or brown, while the middle third are yellow ochre. The lower, top and topgallant sections of the masts are yellow ochre up to the trucks and have blackened doublings. The bands on the fore and main masts are blackened and the yards are black or brown. It is not known exactly how many life boats the ship carried but it was probably between six and eight. One was usually carried in its davits astern, one in davits on either quarter and probably five in two groups in chocks on the skid beams spanning the main hatch. Most of them were probably painted white with a different color below the waterline. During the ship’s 1809-1810 overhaul, the yellow ochre band along the gun port was painted white, according to an entry in the the ship’s logbook on April 7, 1811. The band remained white until it was repainted yellow ochre again in 1814. When the ship was later renovated to resemble her appearance during the War of 1812, the band was repainted white again. Brodine, Jr, Charles E., Michael J. Crawford, Christine F. Hughes. Interpreting Old Ironsides: An Illustrated Guide to USS Constitution. Naval Historical Center, 2007. A fascinating ship that holds a lot of history I have come to respect as I build the plastic model. Great writing here which helps me decide how to choose colors and or understand better construction methods so my model can be built as best as it can for the scale. Thank you for this article.